Paiute women and children in Yosemite Valley 1891. 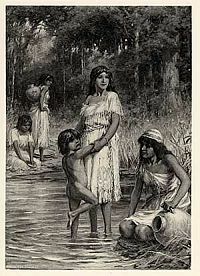 Paiute (sometimes written Piute) refers to two related groups of Native Americans — the Northern Paiute of California, Nevada, and Oregon, and the Southern Paiute of Arizona, southeastern California, Nevada, and Utah. The Northern and Southern Paiute both spoke languages belonging to the Numic branch of the Uto-Aztecan family of Native American languages. The Paiute are particularly well-known through the work of Wovoka and the Winnemuccas. Wovoka, later called Jack Wilson, was the Northern Paiute mystic who founded the Ghost Dance movement. He prophesied an end to white American expansion while preaching messages of clean living, an honest life, and peace between whites and Indians. As it spread from its original source, various Native American tribes synthesized selected aspects of the ritual with their own beliefs, creating changes in both the society that integrated it and the ritual itself. The Sioux adaptation of the Ghost Dance subsequently led to the massacre at Wounded Knee. After that tragedy, the Ghost Dance and its ideals as taught by Wokova soon began to lose energy and it faded from the scene, although some tribes still practiced into the twentieth century. Sarah Winnemucca, daughter of Chief Winnemucca and granddaughter of "Truckee" an interpreter and friend of the white people, became one of very few Paiutes in Nevada able to read and write English. Her writings and activism have been influential, albeit controversial, in the relationships between Paiute and Euro-Americans. Today, modern Paiute rely heavily on the tourism industry to help sustain their culture, and many tourists flock to the regions of the Owens Valley Lake and Mono Lake areas for camping vacations. The establishment of museums and cultural centers open to tourists offers them a way to sustain their cultural heritage and also interact with the contemporary world. The origin of the word Paiute is unclear. Some anthropologists have interpreted it as "Water Ute" or "True Ute." The Northern Paiute call themselves Numa (sometimes written Numu) ; the Southern Paiute call themselves Nuwuvi. Both terms mean "the people." The Northern Paiute are sometimes referred to as Paviotso. Early Spanish explorers called the Southern Paiute "Payuchi" (they did not make contact with the Northern Paiute). Early Euro-American settlers often called both groups of Paiute "Diggers" (presumably due to their practice of digging for roots), although that term is now considered derogatory. The use of the name "Paiute" for these people is somewhat misleading. The Northern Paiute are more closely related to the Shoshone than to the Southern Paiute, while the Southern Paiute are more closely related to the Ute than to the Northern Paiute. Usage of the terms Paiute, Northern Paiute and Southern Paiute is most correct when referring to groups of people with similar language and culture, and should not be taken to imply a political connection or even an especially close genetic relationship. The Northern Paiute speak the Northern Paiute language, while the Southern Paiute speak the Ute-Southern Paiute language. These languages are not as closely related to each other as they are to other Numic languages. The Bannock, Mono, Panamint and Kawaiisu people, who also speak Numic languages and live in adjacent areas, are sometimes referred to as Paiute. Estimates for the pre-contact populations of most native groups in California have varied substantially. Alfred L. Kroeber thought that the 1770 population of the Northern Paiute within California was 500. The Northern Paiute traditionally lived in the Great Basin in eastern California, western Nevada, and southeast Oregon. The Northern Paiute's pre-contact lifestyle was well adapted to the harsh desert environment in which they lived. Each tribe or band occupied a specific territory, generally centered on a lake or wetland that supplied fish and water-fowl. Rabbits and pronghorn were taken from surrounding areas in communal drives, which often involved neighboring bands. Individuals and families appear to have moved freely between bands. Pinyon nuts gathered in the mountains in the fall provided critical winter food. Grass seeds and roots were also important parts of their diet. The name of each band came from a characteristic food source. For example, the people at Pyramid Lake were known as the Cui Ui Ticutta (meaning "Cui-ui eaters"), the people of the Lovelock area were known as the Koop Ticutta (meaning "ground-squirrel eaters") and the people of the Carson Sink were known as the Toi Ticutta (meaning "tule eaters." 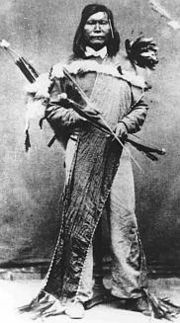 Chief Winnemucca – A chief of the Paiutes. He was also named Poito. Relations among the Northern Paiute bands and their Shoshone neighbors were generally peaceful. In fact, there is no sharp distinction between the Northern Paiute and Western Shoshone. Relations with the Washoe people, who were culturally and linguistically very different, were not so peaceful. Sustained contact between the Northern Paiute and Euro-Americans came in the early 1840s, although the first contact may have occurred as early as the 1820s. Although they had already started using horses, their culture was otherwise largely unaffected by European influences at that point. 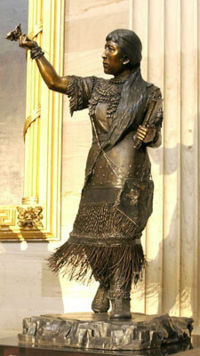 Sarah Winnemucca's book "Life Among the Piutes" gives a first-hand account of this period, although it is not considered to be wholly reliable. 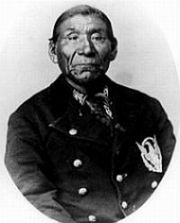 Sarah's grandfather, Truckee (meaning "good" in the Paiute language), was enthusiastically friendly towards white people. He guided John C. Frémont during his 1843–1845 survey and map-making expedition across the Great Basin to California. Later he fought in the Mexican-American War, earning many white friends. Although Sarah was initially terrified of white people, her grandfather took her with him on a trip to the Sacramento area (a trip her father refused to make), and later placed her in the household of William Ormsby of Carson City, Nevada to be educated. Sarah Winnemucca soon became one of very few Paiutes in Nevada able to read and write English. 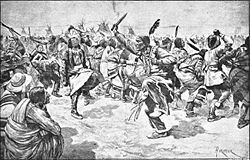 The Pah Ute War, also known as the Paiute War, was a minor series of raids and ambushes initiated by the Paiute, which also had an adverse effect on the development of the Pony Express. It took place from May through June of 1860, though sporadic violence continued for a period afterwards. 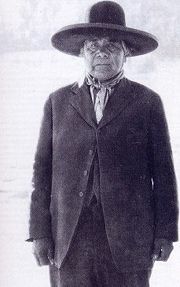 Numaga, chief of the Paiutes during the Pyramid Lake Paiute War. He was named the “Peace Chief”. Catherine S. Fowler and Sven Liljeblad put the total Northern Paiute population in 1859 at about 6,000. As Euro-American settlement of the area progressed, several violent incidents occurred, including the Pyramid Lake War of 1860 and the Bannock War of 1878. These incidents took the general pattern of a settler steals from, rapes or murders a Paiute, a group of Paiutes retaliate, and a group of settlers or the US Army counter-retaliates. Many more Paiutes died from introduced diseases such as smallpox. The first reservation established for the Northern Paiute was the Malheur Reservation in Oregon. The federal government's intention was to concentrate the Northern Paiute there, but its strategy didn't work. Due to the distance of that reservation from the traditional areas of most of the bands, and due to the poor conditions on that reservation, many Northern Paiute refused to go there and those that did soon left. Instead they clung to the traditional lifestyle as long as possible, and when environmental degradation made that impossible, they sought jobs on white farms, ranches or cities and established small Indian colonies, where they were joined by many Shoshone and, in the Reno area, Washoe people. Later, large reservations were created at Pyramid Lake and Duck Valley, but by that time the pattern of small de facto reservations near cities or farm districts often with mixed Northern Paiute and Shoshone populations had been established. Starting in the early 1900s the federal government began granting land to these colonies, and under the Indian Reorganization Act of 1934 these colonies gained recognition as independent tribes. Alfred Kroeber estimated the population of the Northern Paiute in California in 1910 as 300. The Southern Paiute traditionally lived in the Colorado River basin and Mojave Desert in northern Arizona, southeastern California, southern Nevada, and southern Utah. First European contact with the Southern Paiutes occurred in 1776 when Fathers Silvestre Vélez de Escalante and Francisco Atanasio Domínguez chanced upon them during their failed attempt to find an overland route to the missions of California. Even before this date, the Southern Paiute suffered from slave raids by the Navajo and the Utes, but the introduction of Spanish and later Euro-American explorers into their territory exacerbated the practice. In 1851, Mormon settlers strategically occupied Paiute water sources, which created a dependency relationship. However, the Mormon presence soon ended the slave raids, and relations between the Paiutes and the Mormons were basically peaceful. This was in large part due to the diplomacy efforts of Mormon missionary Jacob Hamblin. However, there is no doubt that the introduction of European settlers and agricultural practices (most especially large herds of cattle) made it difficult for the Southern Paiutes to continue their traditional lifestyle. The Utah Paiutes were terminated in 1954 from the list of Indian tribes formally recognized by the American government, but the Paiute people regained federal recognition in 1980. A band of Southern Paiutes at Willow Springs and Navajo Mountain, south of the Grand Canyon, reside inside the Navajo Indian Reservation. These "San Juan" Paiutes were recognized by the Bureau of Indian Affairs in 1980. 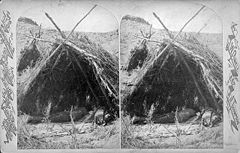 The Paiute, like other tribes of the Great Basin area, were nomadic and slept in domed, round shelters known as Wickiups or Kahn by the Kaibab Paiute. The curved surfaces made them ideal shelters for all kinds of conditions; an escape from the sun during summer, and when lined with bark they were as safe and warm as the best houses of early colonists in winter. The structures were formed with a frame of arched poles, most often wooden, which are covered with some sort of roofing material. Details of construction varied with the local availability of materials, but generally included grass, brush, bark, rushes, mats, reeds, hides, or cloth. They built these dwellings in different locations as they moved throughout their territory. Since all their daily activities took place outside, including making fires for cooking or warmth, the shelters were primarily used for sleeping. The Paiute were largely farmers and hunters. They have a culture rich in family values and tradition, and parents and grandparents bestow the oral history of their ancestors to their children. 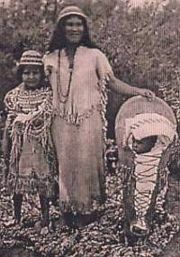 Paiute children were mentored by their parents in hunting, farming, and becoming parents in their own rights, in order to continuously improve their society and maintain their traditions. As with most other Native American groups, the Paiute have ritual dances to express their gratitude to the earth for planting the seeds in the autumn, and the harvest in the spring. Their typical crops were corn, squash, pumpkins, beans, and sunflower seeds. Rabbits and Pronghorn were often traded and shared among neighboring bands of Paiute, and given as peace offerings. Families and individuals moved freely between tribes, and overall enjoyed a peaceful existence. The Paiute would gather hordes of pinyon nuts in the mountains during the fall, which provided critical winter food. The Paiutes have been living off the land for centuries. They have adapted to change and learned how to effectively use the natural tools around them in their lifestyle. The Paiutes of Mono Lake used arrowheads to hunt small game, and since no fish lived in the lake, they ate alkai flies and their larvae, which the women would gather in a basket to eat along with brine shrimp. The Paiute Indians did not waste any part of any animal, using the bones as tools or weapons, and the hides for clothing. Even after the area had been settled, most of the remaining Paiute of Mono Lake continued to live in wickiups, as they had for hundreds of years. Storytelling is a popular part of entertainment in many Native American societies. This stood also true for the Paiute. Stories would recount their origins and would retell the deeds of heroes long gone. There are also many Paiute legends about sacred animals including possums, raccoons, turtles, birds, chipmunks, and wolves. Paiute art was most widely known in the area of basket weaving. Although skilled in other mediums such as wood carvings and arrowheads, making baskets was the most efficient and practical art form for them as they were largely a hunter-gatherer culture. Paiute music was generally performed by men for dance and harvest rituals, and consisted of playing instruments such as drums, flutes, and rattles made from animal bones. In more contemporary rituals, some women are becoming more involved in the musical ceremonies however. The dances have been used to show reverence and appreciation for the bountiful generosity of Mother Earth, and to honor the natural spirits of this world, and the afterlife. In traditional Paiute religion, humans were believed to be comprised of the spirit, mind, and body. Plants and animals are considered to be parts of both the natural and spiritual worlds. In addition to the lesser spirits, the Paiutes also believed in one supreme creator. Their social system had little hierarchy and relied instead on shamans who as self-proclaimed spiritually-blessed individuals organized events for the group as a whole. Usually, community events centered on the observance of a ritual at prescribed times of year, such as harvests or hunting parties. A Northern Paiute named Wovoka was believed to have experienced a vision during a solar eclipse on January 1, 1889. Wovoka had received training from an experienced shaman under his parents' guidance after they realized that he was having difficulty interpreting his previous visions. He was also in training to be a "weather doctor," following in his father’s footsteps, and was known in Mason Valley as a gifted young leader. He often presided over circle dances, while preaching a message of universal love. In addition, he had reportedly been influenced by the Christian teaching of Presbyterians for whom he had worked as a ranch hand, by local Mormons, and by the Indian Shaker Church. He also adopted the Anglo name, Jack Wilson. According the report of Anthropologist James Mooney, who conducted an interview with Wilson in 1892, Wilson had stood before God in Heaven, and had seen many of his ancestors engaged in their favorite pastimes. God showed Wilson a beautiful land filled with wild game, and instructed him to return home to tell his people that they must love each other, not fight, and live in peace with the whites. God also stated that Wilson's people must work, not steal or lie, and that they must not engage in the old practices of war or the self-mutilation traditions connected with mourning the dead. God said that if his people kept by these rules, they would be united with their friends and family in the other world. According to Wilson, he was then given the formula for the proper conduct of the Ghost Dance and commanded to bring it back to his people. Wilson preached that if this five-day dance was performed in the proper intervals, the performers would secure their happiness and hasten the reunion of the living and deceased. Wilson claimed to have left the presence of God convinced that if every Indian in the West danced the new dance to “hasten the event,” all evil in the world would be swept away leaving a renewed Earth filled with food, love, and faith. Quickly accepted by his Paiute brethren, the new religion was termed “Dance In A Circle." Because the first Anglo contact with the practice came by way of the Sioux, their expression "Spirit Dance" was adopted as a descriptive title for all such practices. This was subsequently translated as "Ghost Dance." Wovoka prophesied an end to white American expansion while preaching messages of clean living, an honest life, and peace between whites and Indians. The practice swept throughout much of the American West, quickly reaching areas of California and Oklahoma. As it spread from its original source, Native American tribes synthesized selective aspects of the ritual with their own beliefs, creating changes in both the society that integrated it and the ritual itself. The Ghost Dance took on a more militant character among the Lakota Sioux who were suffering under the disastrous U.S. government policy that had sub-divided their original reservation land and forced them to turn to agriculture. By performing the Ghost Dance, the Lakota believed they could take on a "Ghost Shirt" capable of repelling the white man's bullets. Another Lakota interpretation of Wovoka's religion is drawn from the idea of a "renewed Earth," in which "all evil is washed away." This Lakota interpretation included the removal of all Anglo Americans from their lands, unlike Wovoka's version of the Ghost Dance, which encouraged co-existence with Anglos. Seeing the Ghost Dance as a threat and seeking to suppress it, U.S. Government Indian agents initiated actions that tragically culminated with the death of Sitting Bull and the later Wounded Knee massacre. 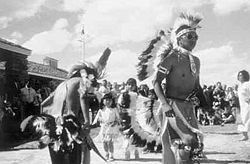 After that tragedy, the Ghost Dance and its ideals as taught by Wokova soon began to lose energy and it faded from the scene, although some tribes still practiced into the twentieth century. Kaibab Paiute Indians dance at the opening ceremony of the joint visitor center of the Paiute people and Pipe Spring National Monument, Pipe Spring National Monument, Arizona. The Paiute government today consists of a tribal leader called a chief, who can come into power either by inheritance, or upon the death of a chieftain without any heirs, in which case the chief is elected by a democratic vote. The chief has to be over 21 years of age and have Paiute background. The offices on modern reservations include chairperson, vice chairperson, secretary, and treasurer. The modern Paiute rely heavily on the tourism industry to help sustain their culture, and many tourists flock to the regions of the Owens Valley Lake and Mono Lake areas for camping vacations. In 1907, the Kaibab Paiute Indian Reservation was established, surrounding the privately owned Pipe Spring ranch. In 1923 the Pipe Spring ranch was purchased and set aside as a national monument. Today the Pipe Spring National Monument - Kaibab Band of Paiute Indians Visitor Center and Museum explains the human history of the area over time. Daily tours of Winsor Castle, summer "living history" demonstrations, an orchard and garden, and a half-mile trail offer a glimpse of American Indian and pioneer life in the Old West. The National Monument was listed on the National Register of Historic Places on October 15, 1966. Southern Paiute communities are located at Las Vegas, Pahrump, and Moapa, in Nevada; Cedar City, Kanosh, Koosharem, Shivwits, and Indian Peaks, in Utah; at Kaibab and Willow Springs, in Arizona; Death Valley and at the Chemehuevi Indian Reservation and on the Colorado River Indian Reservation in California. Some would include the 29 Palms Reservation in Riverside County, California. Fowler, Catherine S. and Sven Liljeblad. 1978. "Northern Paiute." In Great Basin, edited by Warren L. d'Azevedo, 435-465. Handbook of North American Indians. William C. Sturtevant (ed. ), vol. 11. Washington, DC: Smithsonian Institution. Grahame, John D. and Thomas D. Sisk, (eds.) 2002. Southern Paiute in Canyons, Cultures and Environmental Change: An Introduction to the Land-use History of the Colorado Plateau. Retrieved December 7, 2007. Holt, Ronald L. Paiute Indians Utah History Encyclopedia. Retrieved December 7, 2007.